Perennial, multi-stemmed, evergreen tree which grows to 10m tall. The crown is rounded. Grows well in fertile, well drained soil. Suited to Mediterranean type climates. Found along waterways, in bushland and on rocky hillsides. Chiefly found in coastal districts. Leaves are a shiny grey-green colour with the undersurface being green or yellowish brown. Leaves are simple with a rectangular to elliptical shape, entire, with recurved margins. They have a hooked tip and are opposite, growing from 6-10cm long and 10-25mm wide. 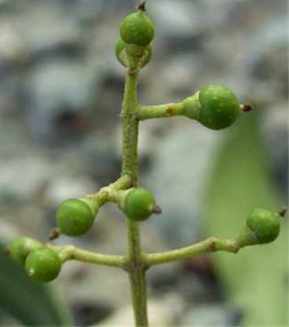 The petiole (leaf stalk) is 10mm long. The bark is grey to blackish-brown. It is rough but may be smoother in older plants. Small green-cream, privet-like flowers which bloom in late spring to summer. The flowers occur in axillary panicles that are shorter than the leaves. The calyx (the sepals of one flower collectively) is 4 lobed and 1mm long and the corolla (the petals of a flower collectively) is greenish white or cream and is 1-2mm long. The fruit is a round drupe with a sharp tip at the end. The fruit is usually 15-25mm long and 6mm in diameter, fleshy and glaucous (dull blue-green in colour with a whitish bloom which can often be rubbed off). When mature the fruit is black to dark purple. The seed is brown, oblong and is 1 to 1.5cm long and oily. The trees have simple leaves which have a green or yellowish-brown underside. The leaves have a curled tip, depressions or groove between the main vein and secondary veins on the leaf underside are absent. African olive may be mistaken for Olea europaea L. subsp. europaea (common olive) that has a grey-green upper surface and an undersurface with a dense covering of silvery, golden or brown scales. The leaves are mostly 3-7cm long and 8-10mm wide without a hooked tip at the apex. African olive is not confused with Olea paniculata (native olive) because O. paniculata has slight depressions (domatia) between the main vein and secondary veins on the underside of the leaf; the leaves are ovate to elliptic and usually >2cm wide.